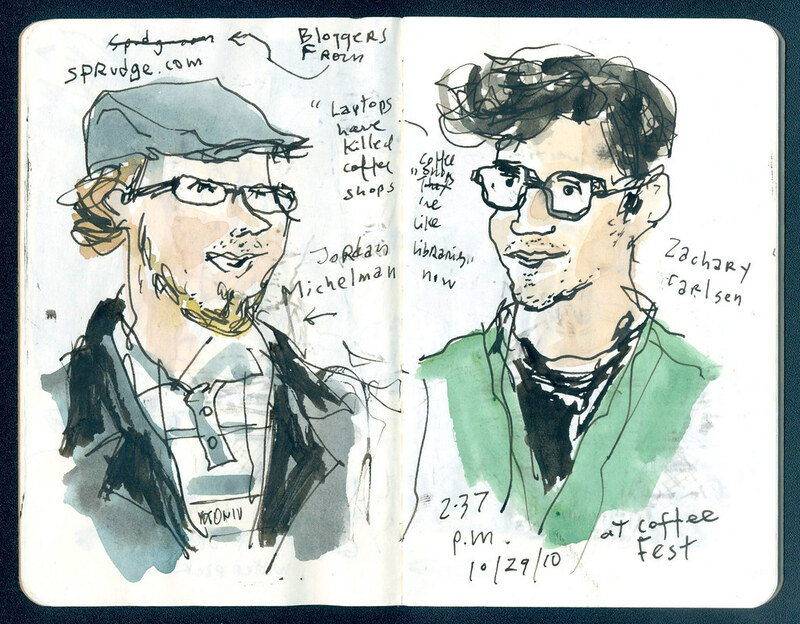 Sketched Oct. 29, 2010, 2:37 p.m.
Jordan Michelman and Zachary Carlsen run Sprudge.com, a popular coffee blog that apparently everyone knows about in Seattle except me. While she interviewed them, I did my part producing this sketch — color added later in the newsroom. It’s true, people go to coffee shops to work. Having an espresso is secondary. Some cafes even have meeting rooms. I’m not sure how you’d change that. Telecommuting from Starbucks probably beats having to show up in the office or working from home. If coffee shops turn into offices, we are going to need a new kind of “third place” to keep us away from home and work. Uncropped version of the sketches on my Moleskine pocket plain notebook. Live tweet photo from Coffee Fest.